Cardiac calcium scoring is a test performed using a CT scanner (also known as a CAT scan) to test the level of calcified plaque lining the coronary artery. Plaque build-up can lead to heart disease or even a heart attack without warning. Heart attacks are the leading cause of death of men and women in the United States. This score can be a helpful tool in determining someone’s a risk level for heart disease or heart attack. After reviewing the calcium score, a patient and their doctor can better determine if there are any behavior changes necessary to prevent future heart conditions. Typical candidates for this test are people age 40-75 who have a moderate risk for heart disease. Factors that can increase the risk of heart disease include smoking, diabetes, obesity, poor diet, high blood pressure and high cholesterol. This potentially life-saving test is quick, pain-free and affordable. The patient lays down while x-ray images are taken from various angles all around the body. The scan itself takes less than a minute. Those images are then read buy a radiologist who will determine a calcium score. This score will be sent to the patient’s primary care provider and available to the patient via the patient portal. 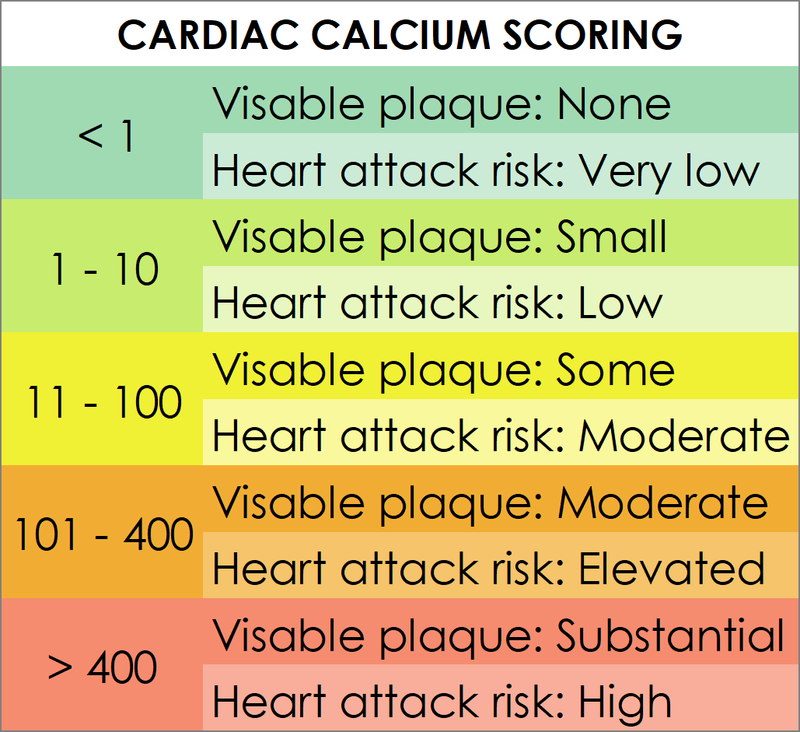 The chart on this page shows the indications for calcium scores. A calcium scoring test does not require a doctor’s referral and is only $115 at Advanced Medical Imaging.